Captain Shaun Chute (above) owner and operator. Shaun is a Marco Island Native. Shaun has fished these waters for over 30 years! You wont find a more experienced guide in this area period. Shaun was awarded his Masters Captains license in 1993 by the United States Coast Guard. He remains current with all the required medical and first aid training to this date. 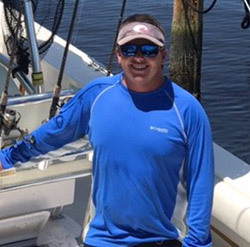 He competed in SKA Southern Kingfish Association tournaments around the state and placed in the top 15 in the division and was invited to compete in the National Championship 3 years. For the past 7 years Shaun has been awarded an A+ Top Charter Guides rating. Shaun was also voted 4 stars in the “Top Rated Guides” which appears on the ESPN Outdoors site for 5 years now. 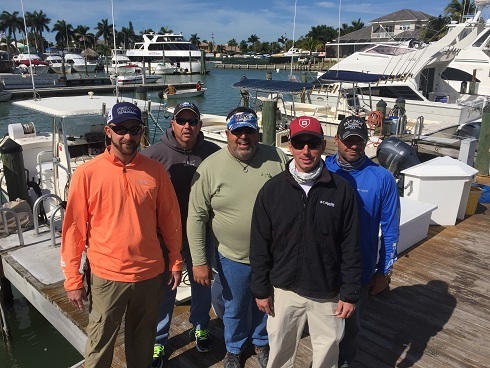 Shaun is in good standing with the IGFA (International Game Fish Association), The Marco Island Charter Captains Association, NACO (National Association of Charterboat Operators,) FCCA and the Yamaha Captains Program. If he isn’t on the water guiding, you’ll find him out fishing with his 2 sons and wife Tricia. Capt. Rob has fished the area for 15 years and there is no one that likes to fish more then Rob. He is addicted! He has fished the coast of the Carolina’s in tournaments. 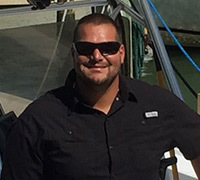 Rob received his captains license in 2003 and is a present member of the Marco Island Charter Captains Assoc. and NACO. Capt. 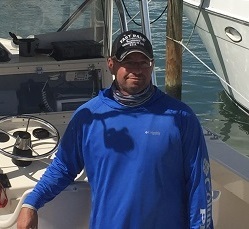 Kyle Is a man of the world, raised fishing the coast of New Hampshire and later Guiding in Alaska during summers and Winters in the Keys. He finally settled down in Southwest Florida and has become a respected fisherman amount his peers. Kyle is great with any family or with the avid Fisherman. One of the nicest guys you will meet..
Born and raised in the backwaters of Southern New Jersey. 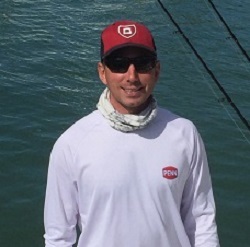 For the past 3 years Brian splits his time between NJ during the spring summer and fall, and Keeping his skills sharp in the colder months by guiding in Southwest Florida during the winters. If Brian isn’t guiding a trip in the Backwaters around Marco Island with clients, you’ll find him exploring new areas on his paddle board with a fishing Pole in hand. If your in Ocean City NJ in the summer look him up. Badfish Fishing Charters. 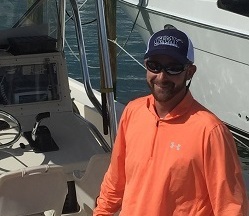 Captain Bobby was raised locally around Marco island and has spent most of his young adalt life fishing and learning the waters of Marco. While in High School Bobby was cleaning the boats and helping out the charter Captains when he could. After high school Bobby went into the US Coast Guard for 6 years but he couldn’t stay away. Bobby is back and brings a great attitude to the business and his customers every day. 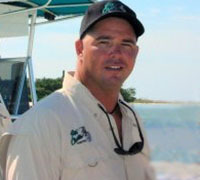 Mark is born and raised here in Southwest Florida and has spent most of his life fishing and water skiing the area. He is very easy going and likes to show families a great day on the water.